Palestine Hotel in Baghdad, where an explosion Tuesday killed three journalists. BAGHDAD, Iraq (CNN) -- U.S. military attacks killed three journalists in two different buildings in Baghdad Tuesday, raising questions about the tactics of U.S. troops trying to take control of the Iraqi capital. A U.S. attack on the Palestine Hotel killed Reuters cameraman Taras Protsyuk, 35, a Ukrainian national based in Warsaw, Poland, the news agency said. It also said three other employees were wounded in the attack. Spanish television network Telecinco cameraman Jose Couso also was killed, according to Telecinco. Couso died during surgery. Separately, Al-Jazeera television reporter Tariq Ayoub was killed at the Arab language network's facilities on the other side of the Tigris River from the Palestine Hotel, near Iraq's Ministry of Information. Three other Al-Jazeera employees were wounded in the strikes, the network reported. 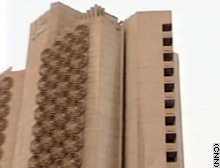 The Palestine Hotel has been a base for much of the non-Iraqi news media, including CNN before its correspondents were asked to leave the country. Iraq's Ministry of Information has a press office at the hotel and has been holding its morning briefings there. Al-Jazeera charged that its facilities were deliberately targeted, an allegation denied by U.S. Central Command. "... we don't target journalists deliberately -- not now, not ever," said Central Command spokesman Brig. Gen. Vince Brooks at his daily briefing Tuesday. Reuters said the incidents raise questions about the judgment of advancing U.S. troops. ''I note that the commander of the U.S. 3rd Infantry has now said that one of its tanks fired a round at the Palestine Hotel," Reuters Editor-in-chief Geert Linnebank said in a statement. "He said it did this after it came under fire from the hotel." "... the incident nonetheless raises questions about the judgment of the advancing U.S. troops who have known all along that this hotel is the main base for almost all foreign journalists in Baghdad. (The Reuters cameraman's) death, and the injuries sustained by the others, were so unnecessary. " Journalists from three Western television networks told CNN they were in the Palestine Hotel when the tank fired and saw no outgoing fire from the hotel. The U.S. Central Command said U.S. forces came under "significant enemy fire" from both buildings and responded "consistent with the inherent right of self-defense." "These tragic incidents appear to be the latest example of the Iraqi regime's continued strategy of using civilian facilities for regime military purposes," Central Command said in a written statement. "The coalition regrets the loss of innocent life and will continue its effort to protect the innocent from harm." Pentagon spokeswoman Victoria Clarke said Tuesday, "I'd like to express again the department's condolences to the families and friends of the journalists who have been killed in this war. They have been doing very, very important work, and we're saddened by their deaths." "War is a dangerous, dangerous business, and you're not safe when you're in a war zone," she said. The Committee to Protect Journalists said Tuesday that the incidents violated the Geneva Conventions and called for an "immediate and thorough investigation," the results of which should be made public. Overall, nine journalists, including the three who died Tuesday, have been killed in combat situations since the Iraqi war began; two others have died in noncombat related incidents, according to various media reports. On Monday, reporter Julio Anguita Parrado, 32, of the Spanish newspaper El Mundo, was killed by an Iraqi missile attack while traveling with the U.S. Army 3rd Infantry Division south of Baghdad, his newspaper said. The attack also killed two soldiers and one other journalist. El Mundo said German photographer Christian Liebig was also killed in the attack.